The Dutch saying, Doe normaal, dan ben je al gek genoeg (literally, Just be normal, then you are crazy enough) sheds light on the work of design team Viktor & Rolf. Viktor Horsting (b. 1969) and Rolf Snoeren (b. 1969) met while they were students at the Arnhem Academy of Art, the Netherlands, in 1988. They both sought to escape the boredom they experienced while growing up in small, quiet, suburban towns in southern Holland. "We had nothing to relate to, never saw glamour except for fashion magazines, and longed to escape to those dream worlds," Horsting once said to an interviewer. By pushing the boundaries of what defines fashion, Viktor & Rolf inspired a new generation of Dutch fashion designers and helped to expose the international fashion media to a country known more for wooden clogs than high fashion. Viktor & Rolf are characterized in Stephen Gan's Visionaire 2000 (1997) as "fashion's biggest fans and its toughest critics." While their works celebrate the detailed craftsmanship of tailoring and consistently reference classic silhouettes from the legendary couturiers Cristóbal Balenciaga, Coco Chanel, Christian Dior, and Yves Saint Laurent, they also critique the twentieth- and twenty-first century's fashion industry, tackle the stereotypes of fashion, and expose its vulnerabilities to a runway audience. Viktor & Rolf 's first collection won the grand prize at the Salon européen des jeunes stylists (1993), a fashion festival in the southern French city of Hyères. When deconstruction was the trend, Viktor & Rolf reconstructed by piling layers of men's button-down shirts to form ball gowns. The following year they suspended flashy gold garments adorned with oversized ribbons and excessive decorations from the ceiling in their installation L'Apparence du vide (1994) at the Galerie Patricia Dorfman, Paris, which sought to critique the aura and hype surrounding fashion. In another experiment, sleek marketing for Viktor & Rolf, le parfum (1996) served to critique the superficial, banal beauty of fragrance advertising. The neatly packaged, limited-edition (2,500) perfume bottles were deliberately designed so that they could not be opened. The bottles sold out at the Parisian boutique Colette. In Launch (1996), presented at the Torch Gallery in Amsterdam, Viktor & Rolf's dream world of the fashion process was realized on a small scale. They explained that, with a doll-sized runway, sketch and draping session, and photo shoot setup, "we created the ultimate goals we wanted to achieve in fashion (but felt unable to). These miniatures represented some of the most emblematic situations in fashion we wanted to become reality" (Personal interview, 23 December 1999). Their dream was realized soon thereafter in the form of a haute couture collection. Viktor & Rolf brought an intellectual approach to the fashion process via art. They pursued haute couture because they found it to be "the most sublime" aspect of fashion. With Dutch government support and the Groninger Museum, the Netherlands, as their sole client, Viktor & Rolf were able to develop creatively without the pressure of maintaining profitability that most young designers experience. In their second spring/summer 1998 collection at the Thaddeus Ropac Gallery in Paris, Viktor & Rolf created their signature "atomic bomb silhouette"-exaggerated on top and pencil-skinny on the bottom. The clothes were dedicated to the millennium (fit either for the biggest celebration ever or apocalyptic destruction) and were deformed with silk balloons, streamers, and other brightly colored party elements. The Viktor & Rolf label was recognized by the Federation de la couture, the umbrella organization that over-sees the Parisian haute couture houses and their events. This prestigious invitation for inclusion occurred even though Viktor & Rolf did not conform to the organization's rules and guidelines. 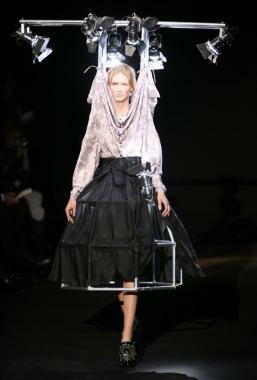 Viktor & Rolf presented their entire fall/winter 1999-2000 collection on the shoulders of one model, Maggie Rizer. As she stood on a revolving platform, Viktor & Rolf layered, in nine successive stages à la Russian-doll style, precisely-engineered jute dresses decorated with Swarovski crystals. Through this mechanism they attempted to showcase their feelings about haute couture as a precious and unattainable jewel. The fashion media's attraction to their exaggerated silhouettes and noteworthy runway performances has always played an integral role in the shaping of the Viktor & Rolf brand identity. With no advertising campaigns, no self-standing boutiques, and no mass-produced clothes to sell, their early relationship with the public depended heavily on the generous amounts of press coverage they received each season. (Close collaborations with photography teams Inez van Lamsweerde and Vinoodh Matadin, as well as Anouschka Blommers and Niels Schumm, also helped further their vision.) The media's acknowledgment of Viktor & Rolf as a leading avantgarde haute couture label was instrumental to the commercial success of their ready-to-wear line. Their first collection sold immediately to sixty stores worldwide during its launch in February 2000. Viktor Horsting and Rolf Snoeren understand that a fashion designer's public image is nearly as important as the clothes that are created. Oftentimes referred to as "the Gilbert & George of fashion," the two present themselves as mirror images of each other: matching dark-rimmed glasses, closely trimmed dark hair, and a serious demeanor despite the humor in their shows. They performed a tap-dance finale with tuxedos, top hats, and canes to "Putting on the Ritz" and "Singin' in the Rain" for their spring/summer 2001 collection. Additionally, they used themselves as models for the launch of their fall/winter 2003-2004 men's wear collection, Monsieur, as they synchronized changes into looks depicting clichés of traditional men's wear. Viktor & Rolf continue to push the boundaries of fashion in ready-to-wear by using the catwalk as a stage for performance art. Models were cast as walking shadows, for example, in their "Black Hole" collection (fall/winter 2001-2002) when they were covered head-totoe in black silhouettes and black makeup. Two years later (fall/winter 2003-2004) their models appeared as fair-skinned, red-haired clones of the actress Tilda Swinton. Through their shows Viktor & Rolf try to bring fantasy, beauty, and magic back to fashion as they forge a path for the viewer to enter their dream. "For us," explains Rolf Snoeren, "it's always about escaping reality, so in that sense the clothes are meant to show beauty first. Beauty and hope. Because cynicism, you know, kills everything." See also Fashion Designer; Fashion Shows. Alonso, Roman, and Lisa Eisner. "Double Dutch." New York Times (8 December 2002): 109. This in-depth interview reveals the personalities and fantasy worlds of Horsting and Snoeren. Horsting, Viktor, and Artimo. Viktor & Rolf. Breda, Netherlands: Artimo Foundation, 1999. This artist's book covers Viktor & Rolf 's early work, 1993-1999. Lowthorpe, Rebecca. "The Gilbert & George of Fashion." The Independent on Sunday (30 September 2001): 35-38. Martin, Richard. "A Note: Art & Fashion, Viktor & Rolf." Fashion Theory: The Journal of Dress, Body & Culture 3 (1999). Martin analyzes Viktor & Rolf 's early works and emphasizes their importance in crossing the boundaries of fashion with art. Spindler, Amy. Viktor & Rolf Haute Couture Book. Groningen, Netherlands: Groninger Museum, 2001. A retrospective exhibition catalog featuring the haute couture collections at the Groninger Museum.